One of the most important parts of shopping for a new pair of boots is determining which size to get. Since each brand is different, you’re boot size in one brand may not be the same size in another. We put this boot sizing guide together to hopefully clear up some confusion. We'll first explain how size systems work and then get into the details of how to properly determine your boot size and what to look out for when shopping for boots in-store or online. There are different ways of sizing footwear globally with many countries having their own sizing system. In the world of boots, the most common boot sizing systems you’ll come across are US, UK, European and Japanese. If you are in the United States, most boot brands will offer US standard sizing. Depending on the brand you may also encounter brands from other countries that use international sizing. A good example is shopping for a pair of fine leather Italian dress boots that uses the European sizing system. In these cases using a sizing chart will help in converting international sizes (we found an easy to use one here). Boot and shoe sizing consists of two factors: Sizing number (overall length) and width size (foot width). The sizing number is represented by a number and the width is represented by a letter. For example a boot size in "10D" means size 10 with a medium width. While most people fall under a medium (D) width, people with narrow or wide feet will have to adjust their width size when shopping for a pair of boots. Below is a men’s and women’s width sizing chart for reference. Along with boot sizes fitting differently between footwear brands you may also notice that not all sizing is uniform within the same brand. A good example is a brand like Red Wing that offers both the Iron Ranger and the Classic Moc boot. Even though both boots are made in the same factory, you’ll notice a slight difference between models with the Classic Moc having a slimmer fit. This causes some people to have to size up a half size from their Iron Ranger size to get a comfortable fit in the Classic Moc boot. The slight difference is due to what’s called a “last” and it’s important to know how this impacts boot sizing. Example of a boot last. 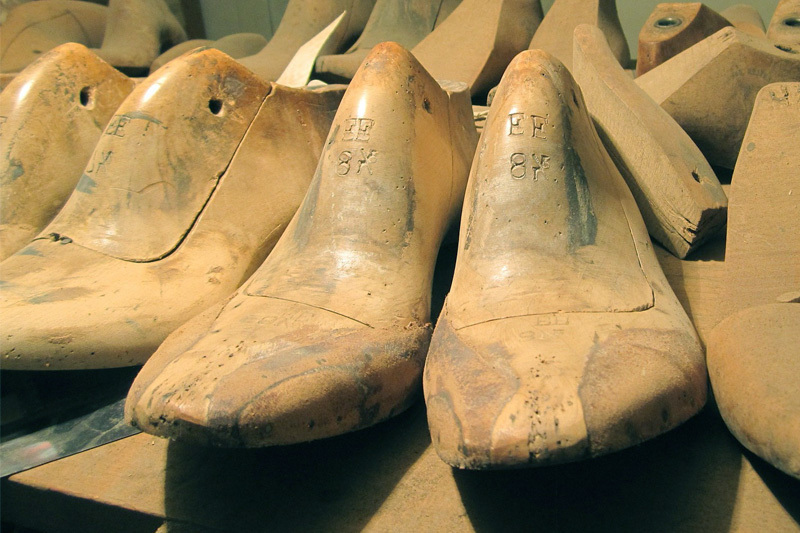 A last is wood or plastic mold that determines the boot’s shape and size. It mimics the shape of a human foot to shape the boot’s toe, heel and girth dimensions. There is no such thing as a standard universal last and as a result each brand has their own unique lasts. This explains inconsistencies in sizing not only between brands but within a brand. How does a boot last determine fit? Continuing our example from before, both the Iron Ranger and Classic Moc boot are built on different lasts. 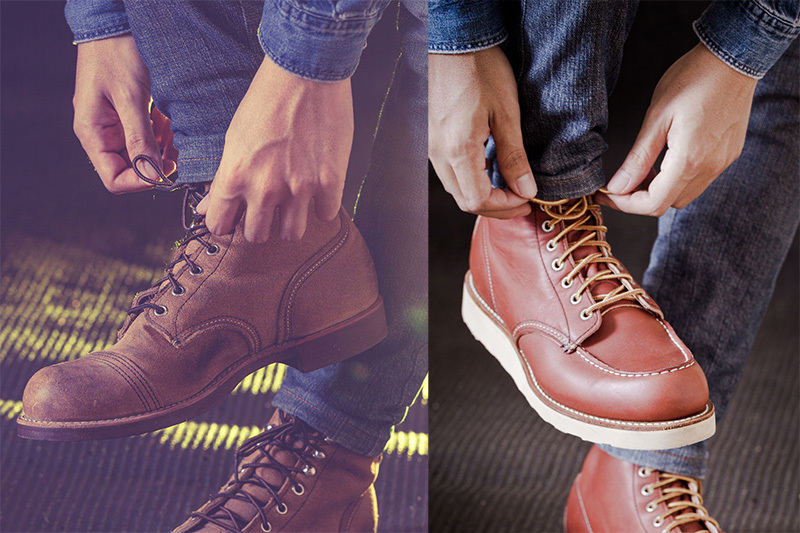 While the Iron Ranger is built on the Red Wing #8 last, the Classic Moc boot is built on the #23 last. What you get are two boots that fit slightly differently despite being made by the same company. You’ll likely only hear about a boot’s last when shopping for welted boots and crafted boots. It’s helpful to know how a last fits (narrow, wide toe box, etc) to help determine which size is best for your feet. The best measure to take is to try the boot on in person. But that’s not always possible, so brand’s often describe their lasts to help online shoppers make better decisions. Although some boots fit true to size, most boots run large. You’ll often hear brands suggest to “size down” when shopping for boots, but size down from what? Size down from your sneaker size? Or your dress shoe size? The answer is your Brannock size. Brannock is the company that makes a foot measuring device called the Brannock Device. What it offers is a universal shoe size that footwear brands and resellers can use as a point of reference. What a Brannock device does is measure you foot’s heel-to-length, arch length and foot width. Almost all brick and mortar stores that sell shoes and boots have a Brannock device to take customer measurements. If you don’t know your Brannock size the easiest thing to do is go to your local footwear store and get your feet measured. You can also purchase a Brannock device of your own online and measure your feet at home. The benefits of getting your feet properly measured on a Brannock device include knowing your baseline foot size as well as getting to measure each foot separately. What many people don’t realize is that each of their feet may be a slightly different size. For example, your right foot might be slightly wider than your left foot. In this case you’ll adjust your boot width to accommodate your wider foot. Painful and ill fitting shoes and boots are often a result of wearing the wrong size. Knowing your Brannock size can help you pick boots that fit properly and comfortably. Toes - You want your toes to have enough room to move and wiggle around. If you're toes are squeezed together than you know the boot’s toe box is too small and it’s time to size up. Improper toe room are often the primary cause of hammer toes, bunions, ingrown toenails and other foot problems so it’s important to make sure your toes are comfortable. Width - Your boots should fit snugly on the sides of the foot while still having room around the toes. Normally your boots would fit tighter than a pair of sneakers to allow the leather uppers to stretch and conform to your foot over time. Snug doesn’t mean too tight however. If a pair of boots feels like it’s suffocating your foot then that’s a sign you should size up or go wider. Feel - Stand and walk in a new pair of boots to make sure they are bending in the right places without any discomfort. If there is painful pinching or stabbing anywhere in the boot then that could be a sign that you are wearing the wrong size. Boot break-ins shouldn’t ever be incredibly painful. Most of the time painful break-ins are due to ill fitting boots. Make sure to wear the correct thickness socks when determining boot fit. Socks - You want to make sure you are wearing socks of the correct thickness when trying to determine your boot size. At the bare minimum you want to wear a pair of athletic cotton socks. Be mindful of what kind of boot you are purchasing and what socks you’ll be wearing with them. For example winter boots will have to size up to accommodate thicker wool socks. Although getting to a shop and trying on a pair of boots in person is the best way to get the correct size the first time around, not everyone has their favorite brands available to them locally. Thankfully we have online shopping where we can order boots from all around the world. Here are a couple of quick tips when shopping for boots online. Generous return policies are a must - When shopping online for boots, especially from a brand you’ve never worn before, the chances of ordering the wrong size is pretty good. Go with an online retailer that accepts free or no-hassle returns. Not only will your pocketbook thank you, but your feet will too knowing that the correct fit is only an exchange away. Ask questions - Don’t be afraid to contact a boot brand and ask them about their fit, lasts, and sizing recommendations. If you have your Brannock size, it would be much easier for them to recommend a size based on your foot dimensions. Newer PostBoot Care: Saddle Soap vs Mink Oil - What's the difference?